Reset your comfort and style in the bedroom. House and Home products might be of assistance when it comes to a fashionable choice for your comfort. 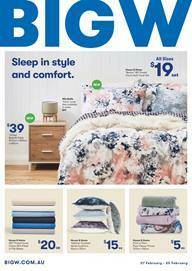 Check out Big W Catalogue bedroom products on the first part of the newest sale. Polar fleece throws, velvet cushions, and sheet sets and quilt cover sets are the most interesting products of this catalogue. Most of them seem to be new items. Their prices are also unique. That exclusive range of Big W stores can be so profitable if you spend wisely. Also, Egyptian cotton towels range is on sale by 30% discount. Shop the products of Big W for the best prices of the month. You may also find great offers of mattress toppers. On top of all these, there is the pillow. A comfortable pillow that is designed for your sleeping style is the vital part of every bedroom. Remember to see this catalogue, don't skip the ads on this publish. Follow our Facebook page where you can see all these updates.